Lyme disease is a bacterial infection that is spread through the bite of one of several types of ticks. 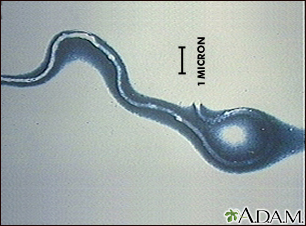 Lyme disease is caused by bacteria called Borrelia burgdorferi (B burgdorferi). Blacklegged ticks (also called deer ticks) can carry these bacteria. Not all species of ticks can carry these bacteria. Immature ticks are called nymphs, and they are about the size of a pinhead. Nymphs pick up bacteria when they feed on small rodents, such as mice, infected with B burgdorferi. You can get the disease if you are bitten by an infected tick. There are three stages of Lyme disease. Stage 1 is called early localized Lyme disease. The bacteria have not yet spread throughout the body. Stage 2 is called early disseminated Lyme disease. The bacteria have begun to spread throughout the body. Stage 3 is called late disseminated Lyme disease. The bacteria have spread throughout the body. A tick must be attached to your body for 24 to 36 hours in order to spread the bacteria to your blood. Blacklegged ticks can be so small that they are almost impossible to see. Many people with Lyme disease never even see or feel a tick on their body. Most people who are bitten by a tick do not get Lyme disease. 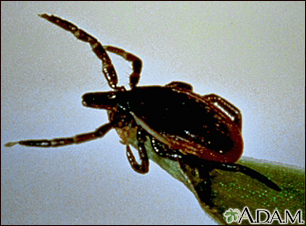 There may be a "bull's eye" rash, a flat or slightly raised red spot at the site of the tick bite. Often there is a clear area in the center. It can be large and expanding in size. This rash is called erythema migrans. Without treatment, it can last 4 weeks or longer. Symptoms may come and go. Untreated, the bacteria can spread to the brain, heart, and joints. A blood test can be done to check for antibodies to the bacteria that cause Lyme disease. The most commonly used is the ELISA for Lyme disease test. An immunoblot test is done to confirm ELISA results. Be aware, though, in the early stage of infection, blood tests may be normal. Also, if you are treated with antibiotics in the early stage, your body may not make enough antibodies to be detected by blood tests. In areas where Lyme disease is more common, your health care provider may be able to diagnose early disseminated Lyme disease (Stage 2) without doing any lab tests. People bitten by a tick should be watched closely for at least 30 days to see if a rash or symptoms develop. 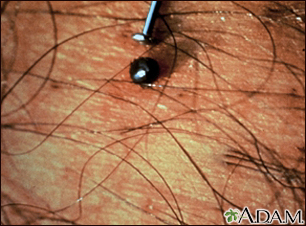 The person has a tick that can carry Lyme disease attached to his or her body. This usually means that a nurse or doctor has looked at and identified the tick. The tick is thought to have been attached to the person for at least 36 hours. The person is able to start taking the antibiotic within 72 hours of removing the tick. The person is 8 years or older and is not pregnant or breastfeeding. Local rate of ticks carrying B burgdorferi is 20% or higher. The choice of antibiotic depends on the stage of the disease and the symptoms. Common choices include doxycycline, amoxicillin, azithromycin, cefuroxime, and ceftriaxone. Pain medicines, such as ibuprofen, are sometimes prescribed for joint stiffness. If diagnosed in the early stages, Lyme disease can be cured with antibiotics. Without treatment, complications involving the joints, heart, and nervous system can occur. But these symptoms are still treatable and curable. In rare cases, a person keeps having symptoms that interfere with daily life after they have been treated with antibiotics. This is also known as post-Lyme disease syndrome. The cause of this syndrome is unknown. Symptoms that occur after antibiotics are stopped may not be signs of active infection and may not respond to antibiotic treatment. A large, red, expanding rash that may look like a bull's eye. Had a tick bite and develop weakness, numbness, tingling, or heart problems. Symptoms of Lyme disease, especially if you may have been exposed to ticks. Take precautions to avoid tick bites. Be extra careful during warmer months. When possible, avoid walking or hiking in the woods and areas with high grass. Wear light-colored clothing so that if ticks land on you, they can be spotted and removed. Wear long sleeves and long pants with pant legs tucked into your socks. Spray exposed skin and your clothing with insect repellant, such as DEET or permethrin. Follow instructions on the container. After returning home, remove your clothes and thoroughly inspect all skin surface areas, including your scalp. Shower as soon as possible to wash off any unseen ticks. Grasp the tick close to its head or mouth with tweezers. DO NOT use your bare fingers. If needed, use a tissue or paper towel. Pull it straight out with a slow and steady motion. Avoid squeezing or crushing the tick. Be careful not to leave the head embedded in the skin. Clean the area thoroughly with soap and water. Also wash your hands thoroughly. Save the tick in a jar. Watch carefully for the next week or two for signs of Lyme disease. If all parts of the tick cannot be removed, get medical help. Bring the tick in the jar to your doctor. Cameron DJ, Johnson LB, Maloney EL. Evidence assessments and guideline recommendations in Lyme disease: the clinical management of known tick bites, erythema migrans rashes and persistent disease. Expert Rev Anti Infect Ther. 2014;12(9):1103-1135. PMID: 25077519 www.ncbi.nlm.nih.gov/pubmed/25077519. Centers for Disease Control website. Lyme disease. www.cdc.gov/lyme/. Updated November 16, 2017. Accessed January 11, 2018. Steere AC. 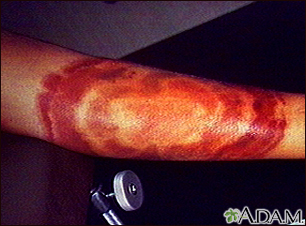 Lyme disease (Lyme borreliosis) due to Borrelia burgdorferi. In: Bennett JE, Dolin R, Blaser MJ, eds. Mandell, Douglas, and Bennett's Principles and Practice of Infectious Diseases, Updated Edition. 8th ed. Philadelphia, PA: Elsevier Saunders; 2015:chap 243. Jatin M. Vyas, MD, PhD, Assistant Professor in Medicine, Harvard Medical School; Assistant in Medicine, Division of Infectious Disease, Department of Medicine, Massachusetts General Hospital, Boston, MA. Also reviewed by David Zieve, MD, MHA, Medical Director, Brenda Conaway, Editorial Director, and the A.D.A.M. Editorial team.